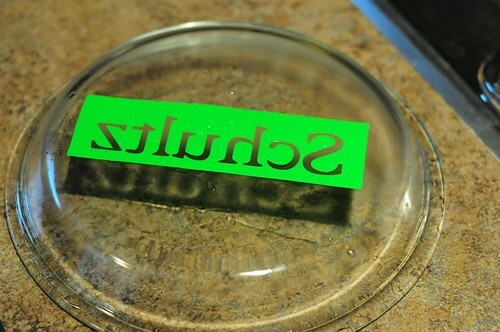 Glass etching is something I've been meaning to do for a LONG time. I bought my etching cream about a year ago, with good intentions. I finally got around to doing some etching. Perfect excuse: a wedding gift. A friend of mine recently got married (remember the ring bearer pillow, and flower girl accessory). She loves to cook. She's a good cook! 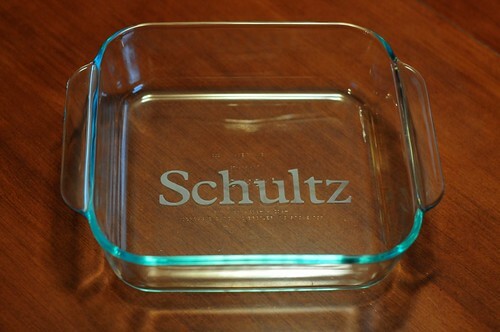 Well for her gift, we bought her a big set of pyrex dishes with lids. Perfect for the one who's always cooking for others. 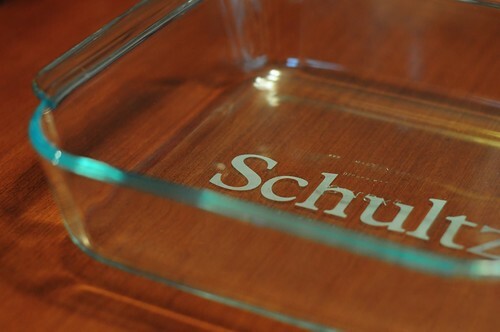 I decided I wanted to etch her new married name on the bottom of all her dishes... so that, generous person that she is, she always gets her dishes back when she brings food to people. The process is super simple, and I'm not sure why I put it off so long. First step is to decide what you want it to say. Then, using your Cricut, you type it in, in reverse order, with the Flip function turned on. Cut it the size you want on vinyl. Then take some transfer tape... and transfer the stencil to the pan you want (I tried with out transfer tape, because I thought I was out... and it was disastrous. It worked.. but it was kinda sloppy, and hard to get the letters nice). PUt the etching cream on thickly, and let sit for a few minutes (says 60 seconds on the bottle.. but I let it go extra long). Rinse off the etching cream (you can actually scrape most off and put back in the bottle to reuse, I'm thrifty like that). 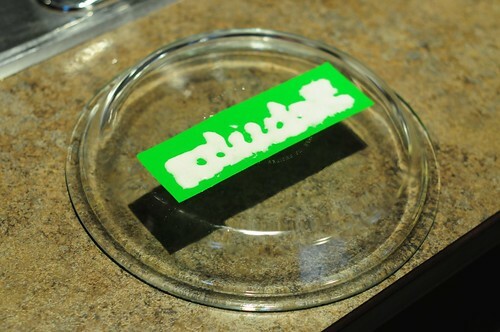 Peel off the vinyl, and Voila! Super simple... I'd love to do this with some designs, etc on my own dishes. So many great ideas and designs out there on the web. Vases, glass kitchen storage canisters, cake stands/covers.... I'm definitely going to play. You can also use it on mirrors. Most of the tutorials I've seen out there actually hand cut their stencils with an xacto knife... so it's doable. A Cricut or Sillouette just makes it super easy! oh I really love this! i've been wanting to try this- now i will just have to. great job!